Panama City Beach, in Florida’s panhandle, is working around the clock to overcome an impression many have about the city that hasn’t ever really been entirely true—that Panama City Beach is, first and foremost, a party town. Back in 1996, MTV hosted its Spring Break coverage from Panama City Beach. Since then, the town has had peaks of mania every couple of years as college kids descended to celebrate the end of winter. But while the craziness never topped or even came close to ‘96, the general sense of “stay away from PCB in March” persisted for anyone not interested in copious amounts of alcohol. The truth, though? In a location with miles and miles of uninterrupted shoreline, there has always been a place for travelers of all ages and interests…especially as the Spring Break scene very rarely strayed from a few well-known hotels on a very small section of beach. That said, it didn’t stop plenty of people from booking other destinations to avoid the kind of crowds they would worry about running into. So, in 2016 (after a particularly rowdy March in 2015), Panama City Beach made the unprecedented move to stop Spring Breakers forever and permanently put their beach on the track for more wholesome press clippings. Starting that year, alcohol is outlawed on all sandy beaches for the month of March. Yeah, Spring Break is clearly no more. What does that mean for Panama City Beach and the local suppliers who need to make a living? Well, in 2016 and 2017, the city has experienced, roughly, a 40 percent drop-off in March tourism. However, while that sounds terrible overall, March has always been the third or fourth best month for tourism and that massive March drop equates to only one percent year-over-year which isn’t that bad in the context of Florida tourism overall. 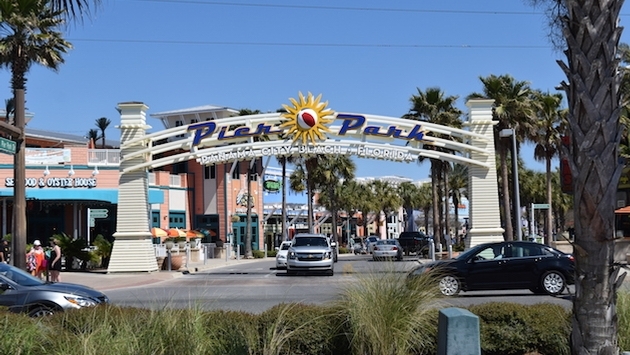 What is Panama City Beach doing to replace the lost college tourism? It is doubling down on families. Think about it: Take four college kids strapped for cash for anything other than a 30-pack of Natty Ice and replace those with a family of four looking forward to a weekend of family fun in the sun. Who do you think is better for the local economy? Maybe the demand for hotel rooms has dropped off—PCB is reporting the lowest hotel rates for March in 15 years—but, overall, that family of four is going to spend a lot more at restaurants, attractions and other local business while being a lot less impactful in terms of wear and tear for their accommodations or the local beachfront. While in Panama City Beach with my family, I had the chance to talk with David Demarest, the Public Relations Manager for the town. Of course, it’s his job to paint the rosiest possible picture of decisions like this, but it was pretty clear from our experience that he’s correct in his assessment, that the loss of Spring Break tourism is a net positive for the city. It’s addition by subtraction in a big way. The next step is gearing up for more and more families to figure it out. My family stayed at the Sheraton Bay Point Resort in Panama City Beach—it’s off the main beach strip by a few miles and the trade off for a few extra minutes driving is a luxury stay with a private beach and top-notch dining options overlooking St. Andrew’s Bay. It’s a AAA Four-Diamond resort with 320 rooms, group space, a full-service spa and some of the most ridiculous sight-lines of any property I’ve toured in Florida. Meanwhile, the privately-owned properties on the beach are making room for a number of brand-name hotels and resorts currently being built over the next couple of years. The city is also ramping up their promotions in cities northbound along the I-65 corridor (Birmingham, Nashville, etc.) and in places that offer direct flights to Panama City thanks mostly to Southwest Airlines, including Chicago, Dallas, Baltimore and St. Louis. Their main competition, according to Demarest, is “whatever Florida beach you’ve heard of,” and it’s a statement that is oh-so-true. Florida’s beach economy has been almost entirely dependent on nostalgia for years—people vacationing where their family has always vacationed. To that end, Panama City is not alone in trying to reach new consumers by showcasing all the reasons they might be more attractive of a destination than in previous generations. For Panama City Beach, however, any extra difficulties in turning over the former college crowd can be easily overcome simply because they were a great family destination all along, they just need more parents to realize it.